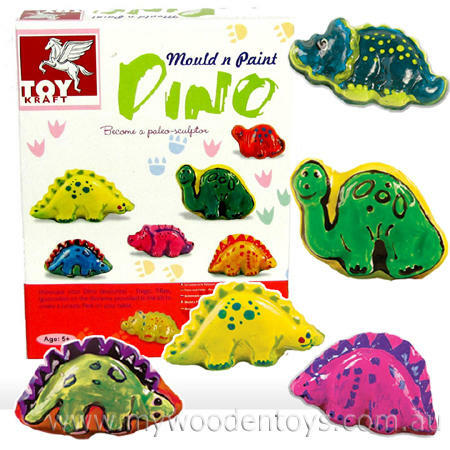 Mould & Paint Dinosaurs is a fun craft toy from Toy Kraft which includes all you need to create a world of dinosaurs diorama. This set contains Plaster of Paris and six re-usable moulds to make your dinosaurs. There is a Tempera paint set in six lovely colours, a brush and six stands and rings for display. This set also includes a cardboard display panel for your dinosaurs to live in. Material: Plaster Paris, Child safe paint, plastic moulds & stand, cardboard display panel. We like this because: "Dino's, plaster and paint... wow can it get any better!" I just wanted to thank you for the very prompt arrival of my order. It is lovely to received such quality wooden toys that will no doubt bring a huge smile on the faces of my kids. I will definitely shop here again and will highly recommend you to my friends Christmas Advent Calendar shopping done!!! Thank you.